If you have to frequently invite the same collaborators for your documents and spreadsheets, you'll find the process tedious. 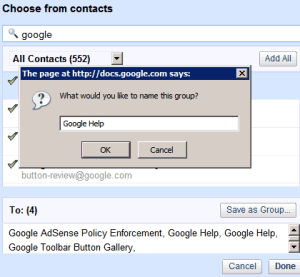 Fortunately, you can create groups and add all the contacts from a group in only 4 clicks. 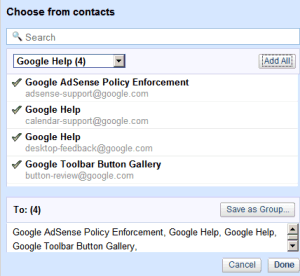 You can create a group by going to the Contacts section of Gmail or using this rather new contact picker (screenshots 1-3). 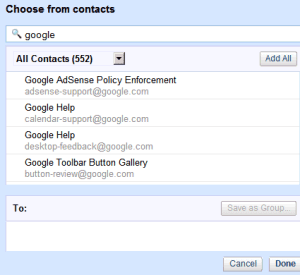 Search for the contacts you want to add and click on their name. 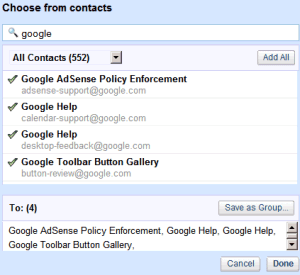 There's also an "Add All" button that lets you add the contacts displayed in the current view. When you're done, click on "Save as group", type a name for the group and close the window. 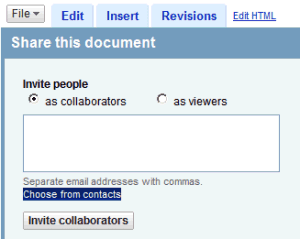 Groups can only be edited and removed from the standard Gmail interface. 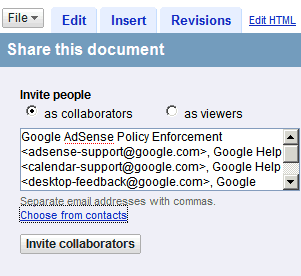 The next time when you need to invite the collaborators, click on the "Choose from contacts" link from the Share tab, select your group from the list and "Add All" (screenshots 4-6).